Did you know Thanksgiving is even celebrated in far flung places like Carealot? The realm of the Care Bears turns out to be not much different than our own (except for the flying cars made out of clouds) as everyone is working hard to prepare for Grams Bear’s arrival. 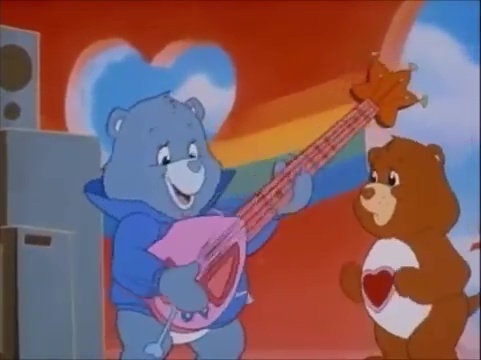 But like any first responder, the Care Bears are always on call, even on Thanksgiving! So it is that Share Bear heads to Earth to help a human brat figure out what he’s going to say in his big Thanksgiving speech to his home town! And while anguishing over whether to open with a joke, to delve deep into the history of the holiday or merely gloss over it in favor of a more modern message involving feelings and other mushy sentiments is a definitely DEFCON 2 level Care Bear crisis, poor Share Bear has inadvertently walked into the middle of a DEFCON 1 take-over-the-world plot involving poison pies! It’s up to Grams Bear to save the day, battling Sour Sam with her own happy pies and an action packed climax that no one who ever owned a Care Bear could have ever imagined occurs that sees Sour Sam attempt to bake Grams Bear into a pie, Grams Bear and her crew throwing pies at Sour Sam in a desperate bid to defeat his Crabby Pie cannon and finally Sour Sam getting baked with Grams Bear’s goody goody pie! 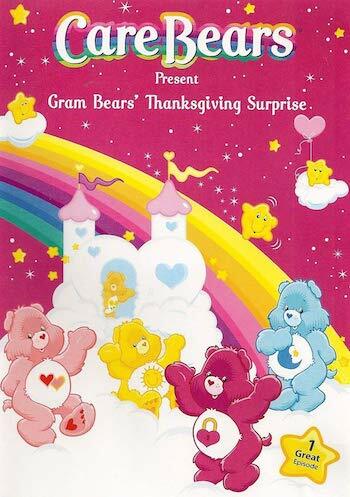 The biggest surprise of Grams Bear’s Thanksgiving Surprise is how much drama, thrills and even horror it packs into a 24 minute package that on the surface appears to be a sugary sweet 1980s infomercial for American Greetings’ monstrously successful franchise. 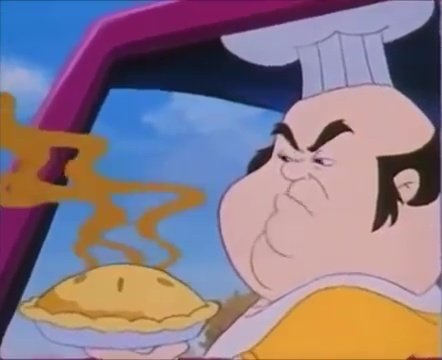 It is that of course, but Sour Sam and his putrid pies is the stuff of nightmares, a subplot involving one of the Care Bears being upset that Grams Bear isn’t the quiet old lady he’s used to, but instead now rides a motorcycle and plays electric guitar is a surprisingly effective examination of how people can change but still be the same person we love, and the never a dull moment breakneck pace of it all showed that something that at first glance appeared to merely be corporate junk calculated to move as many stuffed animals off the shelves as possible, could also be relative pain free and entertaining corporate junk.